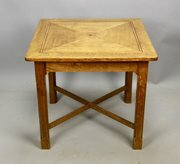 A lovely Arts and Crafts inlaid oak low occasional or coffee table, dating to circa 1900. 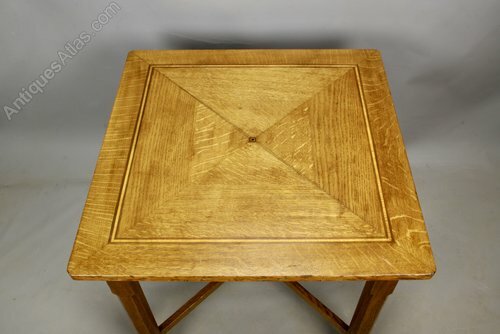 A really practical and quite rare thing to find as there tended not to be many low tables of this larger size made at this period. We enjoyed its use at home for nearly 10 years! The top is inlaid with stringing and the corners are subtly shaped, whilst the supports are chamfered. All signs of quality. 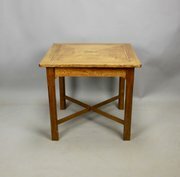 It is stable and strong and in good condition, commensurate with age, with minor age related markings, and has been rewaxed. The top measures 58.5cm (23") square and it is 52.5cm (20 1/4") high.